Few people from any walk of life, much less actors, live to see their names become part of the language, but this charming, mustached leading man was so memorable in The Story of Alexander Graham Bell (1939) that for years afterward a telephone was known as an "ameche." 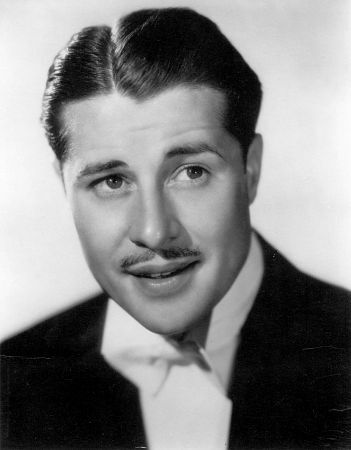 A veteran of dramatic radio (like his brother Jim), Ameche debuted on-screen in a 1933 Chicago-made short subject, Beauty at the World's Fair and settled in Hollywood after winning a bit in Clive of India (1935) that earned him a long-term contract at 20th Century-Fox. He spent many years playing straight-arrow types, second bananas and, finally, leads in such light fare as One in a Million (1936), Alexander's Ragtime Band, In Old Chicago (both 1938), The Three Musketeers, Midnight (both 1939), Down Argentine Way (1940), Moon Over Miami (1941), Heaven Can Wait (1943, a rare and delicious turn as a not-so-nice-guy), and Wing and a Prayer (1944). Many of the Fox films made use of his fine singing voice, as well. Ameche was as active on network radio as he was on-screen, but as his film career waned, he found newfound success on the airwaves with Frances Langford as The Bickersons, whose hilarious battles continued on record albums and commercials for decades to come. From the 1950s through the 1970s, he worked only sporadically, most notably as the emcee on the TV circus program "International Showtime." Then he was plucked out of semiretirement to play one of the wealthy, miserly brothers in Trading Places (1983, with Ralph Bellamy as his selfish sibling), and suddenly he was "hot" again. His exuberant performance as one of the rejuvenated old men in Cocoon (1985) earned him a Best Supporting Actor Oscar and brought full circle one of the great comeback stories of recent Hollywood history. Aside from the inevitable Cocoon: The Return (1988), later roles included Harry and the Hendersons (1987), a bravura turn as a timid bootblack in Things Change (1988), a costarring turn in the little-seen Oddball Hall (1990), a farcical role as Tom Selleck's forgetful father in Folks! (1992), and cameos in Coming to America (1988) and Oscar (1991), both directed by the man responsible for putting Ameche's career back on track, John Landis. His unmistakable voice was put to excellent use in the live-action Disney animal saga Homeward Bound: The Incredible Journey (1993). He completed his scenes in Corrina, Corrina (1994) just days before his death.